As the final day of Hack/Doc Fest at Butler wrapped up the team continued its accessibility work, reviewed the course overview plugin, and discussed our upcoming Moodle 3.1 recommendation. On Day 2 we created a long “scroll of death” course with numerous accessibility issues baked in. On Day 3 we began building out the improved versions of this course using stock Moodle, the grid course format, and the collapsed topics course format. Evaluating the updated courses with various accessibility tools to verify that we truly fixed all the problems. Writing a blog post describing the various issues with the badly-designed version and how they were addressed in the fixed ones. Publishing the courses to a “Moodle Museum” category in the CLAMP Moodle Exchange. In addition we discussed having a having a “Moodle Accessibility” online hangout in July and contributing the example courses to Moodle core for use in their demo site. Related to these efforts we looked at how to create an “accessibility” toggle for the Grid Course Format that lets users switch between the grid-style course and the default topics course. Issue #23 in the Grid format project discussed ways of doing this but it took some experimentation to make it a reality. Our “Providing an accessible option to Grid Course Format” documentation explains how to do this. Matt Wright from Butler University demonstrated their use of the Course Overview on Campus plugin. The plugin replaces the default “my courses” page with a dropdown that lets the user browse through all the course categories on the system. How the courses are listed (e.g. title, short code, teacher) is configurable. The list still includes course-specific action items (e.g. a course assignment needs review) but it is concealed in a collapsed content area by default. The category selected is preserved between sessions, so if user choses the “Fall 2016” category it will be there waiting for them the next time they log in. We will be working on our recommendation for Moodle 3.1 over the next week and hope to have it published on June 29. At this point we don’t see any major blockers, but there are a few things (like annotation in the assignment submission view, whether to turn on the Competencies feature, and improvements to cron) that colleges should consider before upgrading. During Day 2 of Hack/Doc Fest at Butler the team tackled a review of third-party plugin compatibility with Moodle 3.0 and 3.1, continued our accessibility work by testing new tools and documenting best practices, reacquainted ourselves with the Workshop plugin, and delved deeply into Moodle 3.1’s new Competencies feature. Course Overview was tested under 3.1 and seemed to work just fine. That said, the way it is configured changed in 3.1; it is now difficult to get to all of the settings on one unified page. View the full list of third-party plugins. Continuing our work from Monday, we created a “scroll of death course” — aka an exceedingly long course — with a variety of accessibility issues. The course was created using the TinyMCE WYSIWYG editor, but edited using Atto. As expected, Atto couldn’t fix much of what had been done incorrectly using TinyMCE, if for no other reason than it didn’t have the same editing options. Many of the problems in the course had to be fixed by going into the source HTML and editing it there. We also intend to look at an option that allows students to switch switch course formats (e.g. grid to topic) to help with accessibility. This requires the user to set a custom profile field called “accessibility” which — when toggled — lets them switch to a designated “accessible” course format. We spent some time experimenting with screen readers on Moodle and other websites. We started with ChromeVox, a plugin for Chrome that allows you to tab through a page and reads the elements to you. The lack of mouse support made it more difficult to use and there isn’t an obvious way to toggle the plugin on and off. We experimented with TalkBack on Android. It works great, but it radically transforms the way you use your phone and introduces a number of double and triple click command for common tasks. It requires you to re-learn how to how to navigate your phone. We also researched optical character recognition techniques and found ConvenientOCR is a plugin for JAWS. This plugin lets you mouse or tab over an image and then OCR it. We did not get to try this plugin, but it sounds promising. JAWS itself is an expensive piece of software that only runs on Windows, but there is a free trial version for those who want to check it out. We continued our review of the new Assignment Submission view and the problems associated with it (see MDL-54165 New grading interface should hide “editpdf” if unoconv is not enabled and MDL-54818 Improve assignment PDF annotation). A number of schools are planning on turning off the PDF annotation component of Moodle until the issues with it are resolved. However, before turning off the feature we wanted to know how many people were using that particular feature at our institutions. We created an ad hoc query that looks for the use the annotation feature in Moodle assignments by identifying occurrences of “comments” and “annotations” in the database. The annotation query is available through CLAMP’s Github; it requires the ad-hoc database queries plugin to run. We fixed two issues with the CLAMP website. We’ve resolved the SSL cert error that occurred when you tried to browse www.clamp-it.org under https. We also fixed a bug that would redirect you to an account sign-up page when accessing http://clamp-it.org. We continued looking at ways to print quizzes and documented a technique involving embedding a quiz within a “book” within Moodle. View the documentation. We spent considerable time at Hack/Doc reviewing Competencies and have come to the conclusion that it’s a complicated new system with an inherent workflow that isn’t well documented. Evidence submitted by faculty for students. Competencies: The building blocks of the system, competencies establish a specific goal, and provide a mechanism for giving evidence that the goal has been met. Competency Frameworks: A collection of competencies. Learning Plans: A method for pushing out a particular set of competencies (possibly taken from multiple frameworks) to students. The single biggest challenge with Competencies is that it assumes you have an existing offline workflow and framework and want to implement it in Moodle. If you have those things, we expect that the tool makes a lot more sense. If you don’t, then the published documentation isn’t going to help understand the usefulness of the tool or how to implement it at your college. In addition, Competencies itself has an implied workflow that isn’t obvious to laypeople. For example, there is a process for students or faculty to request review of competency evidence. The per-student requests for such review appear on the “My Moodle” page, but it’s not clear if there is a place where faculty or learning plan managers could go to see the progress of an entire student cohort (e.g. not just an individual student’s progress toward meeting competency goals, but the entire cohort’s progress). The development documentation does a much better job of explaining the purpose of Competencies and does a better job of explaining how the various pieces fit together. 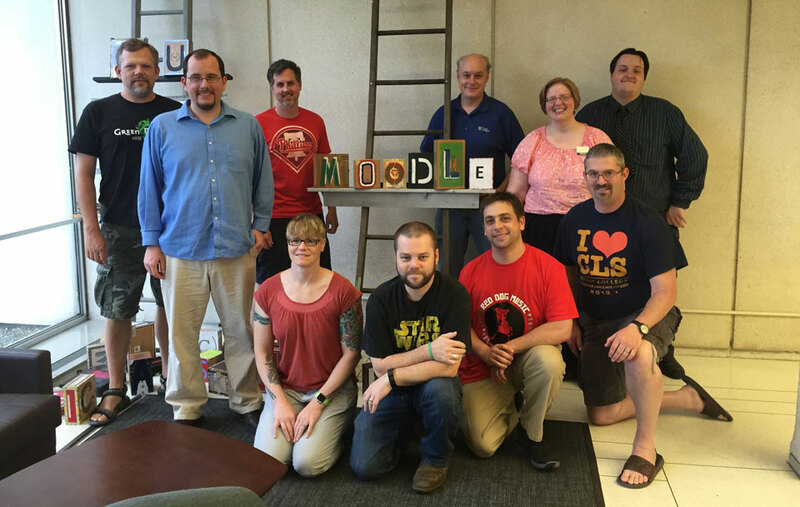 CLAMP kicked off Moodle Hack/Doc Fest on Monday, June 21 with our traditional sprint day. The sprint day exists for everyone to get a jump on the week’s work — a few people (in this case, most of those attending Hack/Doc) arrive early, resolve any logistical challenges (getting to campus, connecting to the local network, making sure sources of caffeine are available throughout the day), and start organizing the week’s worth. During this sprint we came up with our usual tasks list in Google Drive and people signed up for the things they were interested. Then, in a fit of spontaneous documentation, everyone started using that tasks list to provide updates on their progress. It’s not a thing we’ve done before, but it’s working out very well — it provides a running log of what we were working on, and it’s more efficient because we don’t need to spend as much time reporting out each day. Hack/Doc attendees can view the task list in Google Docs; the initial draft of the list is available in the CLAMP Moodle Exchange. In the course of our work we came across a gnarly problem involving the new assignment review interface. This interface allows the user to see a student’s submitted assignment alongside all the relevant grading fields (e.g. add a grade, comments, etc.). The student’s work is rendered as a PDF and the teacher can use Moodle’s annotation capabilities to mark up the paper with their responses. The end result is saved as a PDF and sent to the student as feedback. The problem is with the PDF. If students submitted a PDF, then the process works reasonably well. If they submitted a Word or Open Office document instead, Moodle converts it to PDF for display … or tries to. If you do not have a specific helper application known as unoconv installed on the server (and in our experience, it’s unlikely you will have it), then the PDF conversion fails. Instead you get a blank page. That blank page can then be edited with the annotation tools and submitted as feedback, but that’s not particularly helpful since the student’s original assignment isn’t included. This is documented in MDL-54165 New grading interface should hide editpdf if unoconv is not enabled and is flagged as a critical bug in Moodle 3.1. The proposed resolution to the bug is to revise the interface to allow it to fail gracefully when this tool isn’t available. We encourage the CLAMP community to watch and vote for this issue.